This Rainbow Keeper site is owned by Your_name_here. [Skip Prev] [Prev] [Next] [Skip Next] [Random] [Next 5] [List Sites] Want to join the Rainbow Keeper Webring? This ring brings together alike sites that are committed to the conservation and the future of this planet and all of its inhabitants. Members of this ring will have interests in environmental causes, animal rights, and human rights. Websites will celebrate, as well as educate, diversity in religion and cultures. There is an emphasis of the non-traditional faiths and cultures that survive by Land and Nature. The philosophy of this ring is one of Unity through Diversity. 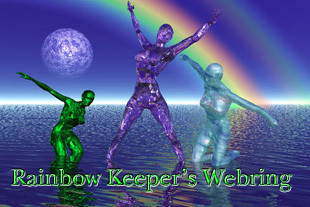 If you consider your website and yourself to be a Rainbow Keeper; then please join our circle and submit your application to the webring. Email one of us your URL and your Site ID number you receive when you submit this form. We will review your website and email you the HTML and the graphics needed. IF you want the HTML now, go ahead and copy it from the header through view source. *A word of caution*: if by the time the Keepers review your page and do not find either a page to indicate that you have a webring page and don't have the HTML on it yet for this ring or you don't have any indication of placing the Rainbow Keeper Webring on your page you will be removed from the queue. The Keepers allow you two weeks to correct this and then you are removed from the queue. If you are in any question about this always email us at ring@imagik.net. We will be more than happy to assist you in this. After admittance to the ring use the following form to edit your site and information. Please email the \er for more information on joining this ring. All applications must meet the above requirements.